Founded in 1935 by William Barrington, Barrington Tea has become one of the world leaders in branded and private label packaging of fine teas from around the world. At an early age William Barrington fell in love with art of making fine teas. From his apprenticeships with the fine tea houses of the early 18th century to becoming a master tea blender, William Barrington knew that to make the perfect cup of tea, you must first start with the perfect tea bud. That tradition of bringing the perfect tea leaf to market continues today with our master tea blenders at Barrington Tea. 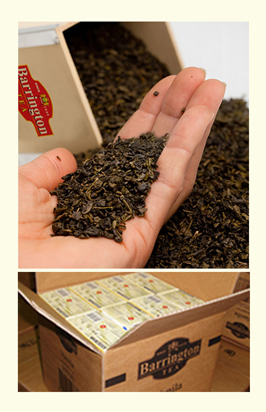 So when you do run across a box of tea with the Barrington Tea logo, you can be assured we’ve put every effort into making it the finest product available at a great price.